Freshpaint, an extremely good painting and decorating company in London, recommended this client to The Billington Partnership. 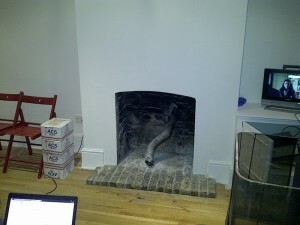 The fireplace requirements were simple. 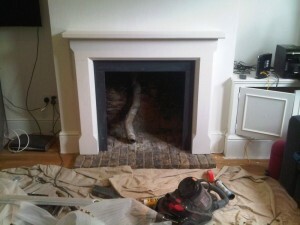 The client had a working fire but needed a surround to finish it off. After supplying the client with a variety of options based on his criteria, he eventually decided upon the 51″ Sienna limestone fireplace from Gallery. The Gallery Sienna 51″ Limestone Fireplace Surround is a solid stone fire mantel made from natural Agean limestone. It is an elegant design with chamfered legs and opening. 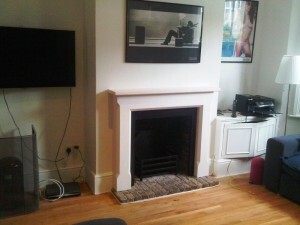 The Sienna limestone fire surround is pre-sealed and manufactured from 100% natural material. Each one is unique due to variations in fossil formation, veining and colour. 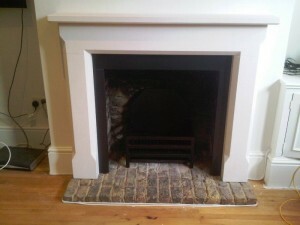 In addition to installing the Sienna surround for our client, we also fitted slate slips. The client was thrilled with the end result.